Power plants use less energy and earn greater profits with Lubrication Engineers (LE) as their partner for lubricants and lubrication equipment. LE manufactures advanced lubricants, and offers preventative maintenance and contamination-control solutions for a variety of power applications, including wind turbines. Conventional lubricants cannot meet the demands caused by the severe operating conditions found in power plants. LE lubricants offer the superior performance that power plants need. LE has experience with a variety of advanced lubricants for power plants, for equipment including coal pulverizers (ball and vertical mills), turbines, air compressors, ash-handling systems, coal feeders, conveyor drives, scrubbing units, and more. 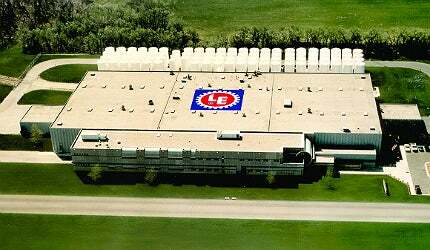 A leader in lubricants since 1951, LE’s worldwide network of consultants and distributors has the expertise to plan, implement and maintain an on-site customized lubrication reliability program. LE can provide the lubricants, reliability products and expertise to help customers increase profits through reduced energy use, reduced wear / increased equipment life, fewer repairs and less downtime, extended oil drains and grease relubrication frequencies, reduced lubricant consumption, product consolidation / reduced need for inventory, and fewer waste disposal concerns. Manufactured under an ISO 9001:2000-certified quality system at its plant in Wichita, Kansas, US, LE’s enhanced lubricants are formulated from highly refined base oils enhanced with additives. The following proprietary additives are available. Almasol® solid wear-reducing additive for lubricants withstands extremely heavy loads, chemical attack and temperatures up to 1,038°C. It is attracted to metal surfaces, forming a microscopic layer but not affecting clearances. Almasol minimizes friction, heat and wear. Duolec® dual-acting additive imparts synergistic properties to lubricants, providing both wear-reducing and extreme pressure protection. It increases oil film strength and is temperature-activated to provide a protective layer that reduces friction and prevents surface wear. Monolec® wear-reducing additive creates a single molecular lubricating film on metal surfaces, vastly increasing oil film strength without affecting clearances. Monolec allows opposing surfaces to slide by one another, greatly reducing friction, heat and wear. LE lubricants are used by thousands of customers in industries worldwide where there are difficult operating conditions, equipment to be protected, and profits to be increased. Its power-generation customers can attest to the results: LE lubricants reduce friction and wear, which leads to reduced electricity usage, longer equipment life, lower operating costs and greater profits. Key LE lubricants for the power industry include the following. Monolec turbine oils reduce varnish and water contamination, lengthen equipment life and extend drain intervals for steam, hydro and gas turbine applications. Duolec vari-purpose gear oils surpass the challenges of the most demanding power applications, including crushers and conveyor gear reducers. Benefits include a 75lb Timken OK load and FZG 14th fail stage pass, as well as superior thermal stability and water separation ability. Pyroshield® synthetic open-gear lubricants are synthetic, high-viscosity lubricants for use in grinding mill and other extreme open gear applications. Our synthetic open-gear lubricants reduce downtime and decrease lubricant and electricity consumption. Almagard® vari-purpose extreme-pressure grease provides long-lasting, water-resistant performance. It dramatically lengthens grease intervals, eliminates bearing failures and can extend bearing life by up to threefold. LE also offers a complete line of contamination-control and other lubrication reliability products. Lubrication Engineers has updated it computer system and internal lubrication part numbers that started in late November last year. Esco has developed a product to make the job of a lubrication technician or maintenance manager easier. Almagard Vari-Purpose Lubricant is suited to extended-service applications, and particularly on and off-road equipment where high impact occurs. Almasol® High Temperature Lubricant is designed to withstand high temperatures, staying in place to provide constant lubrication. It also resists oxidation and vaporisation. An industrial and automotive gear oil with ISO grades ranging from ISO VG 46 to 1500, the Duolec Vari-Purpose Gear Lubricant is designed for use in industrial gear or bearing applications that require a thermally stable, extreme pressure lubricant. The Monolec® Turbine Oil 6461-6463 reduces varnish and water contamination, and lengthens equipment life and drain intervals. The Monolec® Turbine Oil 6471 - 6472 provides high-quality performance in combustion turbines, and combines select base oils with a synergistic mix of additives. Multilec® Industrial Oil helps to reduce the wear caused by high temperatures, water, contaminants and heavy loads. The Oil Safe® Basic Bulk System from Fluid Defense meets our recommended best practice standards. The Perma Flex unit comes filled with the LE lubricant of your choice, and there are many oil and grease options to choose from. Des-Case's standard disposable breathers have been designed to work in a wide variety of industries and applications. This nuclear generating station located in north-eastern United States has been a customer of Lubrication Engineers since 2007. The station's major equipment includes its main unit - a General Electric steam turbine - as well as outboard heater drain pumps, auxiliary vacuum pumps, condenser vacuum pumps and other auxiliary equipment. Simply stated, viscosity is defined as the internal resistance of a fluid to flow. That doesn't sound too difficult, does it? Lubrication Engineers has released a white paper entitled 'Simple Viscosity' on Power-technology. Lubrication Engineers and Advanced Technology Services have announced a strategic partnership in which the two companies will collaborate to develop and implement best practice lubrication reliability programmes for industrial customers. After successfully working together on past projects, LE and ATS recognised their great potential for synergy. Industrial companies looking for a solution to their tough cleanup jobs have a new solution: Greentastic™ Industrial Cleaner. This powerful liquid concentrate cleaner offered by Lubrication Engineers is water-based and contains nine carefully selected and blended active cleaning ingredients - almost twice as many as conventional multipurpose industrial cleaning products. These ingredients work together to provide a robust industrial cleaning solution perfect for many different uses, including oil and grease. Lubrication Engineers has released a white paper entitled 'Monolec Turbine Oil' on Power-technology. Lubrication Engineers has released a white paper entitled 'Steam Turbine Oil Challenges' on Power-technology. Lubrication Engineers is to attend the annual US-based Power-Gen International 2012 conference in the next few months. With the aim of making it easier and faster for online visitors to find the information they need, Lubrication Engineers, Inc has launched a new company website with a new URL at www.LElubricants.com. Lubrication Engineers has harnessed the latest technology and knowledge to formulate a high-quality, high-performance, proprietary synthetic engine oil for gasoline engines. In mid-November 2011, nineteen LE lubricant consultants from various LE distributors met in Wichita, Kansas, US, for MLT I training at the LE plant and training facility. It is a simple fact, better lubrication can lead to dramatic energy savings and an improved bottom line. This ought to interest any plant manager who is looking for ways to reduce operating costs, and is especially significant at a time when stricter government regulations are in direct contradiction to reducing costs. Simply stated, viscosity is defined as the internal resistance of a fluid to flow. That doesn't sound too difficult, does it? Unfortunately, new temperature, speed and pressure demands on lubricating fluids have changed over the years, resulting in several different measurements and classifications being created to describe lubricant viscosity.